Spatial distribution of Aquila prestellar dense cores (blue triangles) over (the curvelet component of) the Herschel column density map. Herschel provides a unique opportunity to study the earliest stages of star formation. What is the origin of the stellar initial mass function (IMF) ? This issue is central in local star formation research and for understanding whether the IMF is truly universal or is likely to depend on metallicity, pressure, or temperature. As prestellar cores and young (Class 0) protostars emit the bulk of their luminosity at ~80-400 microns, the Herschel imaging instruments SPIRE and PACS are ideal for taking a census of such objects down to ~0.01-0.1 Msun in the nearby (0.5 kpc) molecular cloud complexes. We propose an extensive imaging survey of the densest portions of the Gould Belt with SPIRE at 250-500 and PACS at 110-170 microns down to a 5-sigma column sensitivity NH2~1021 cm^-2 or Av~1. Our goal is to make a complete, homogeneous mapping of the Av>3 regions with SPIRE and of the Av>6 regions with PACS, and representative areas at Av~1-3 levels with both instruments. The survey sensitivity is well matched to the expected cirrus confusion limit, so we should detect structures throughout the maps. The target clouds span a range of physical conditions, from active, cluster-forming complexes to quiescent regions with lower star formation activity. We should detect hundreds Class 0 protostars and thousands prestellar condensations in the entire ~145 deg^2 SPIRE survey, i.e. ~10 times more cold objects than already identified from the ground. These numbers should allow us to derive an accurate prestellar core mass function. 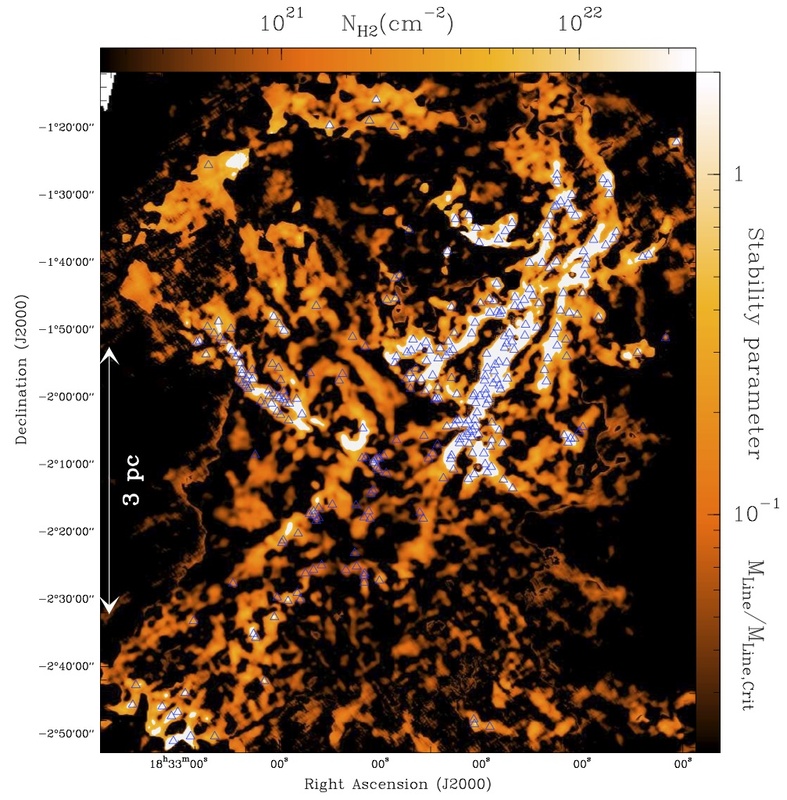 The temperature and density structures of the nearest ( 0.2 kpc) cores will be resolved, revealing the initial conditions for individual protostellar collapse. The large spatial dynamic range of the proposed survey will probe the link between diffuse cirrus-like structures and compact self-gravitating cores. Our main scientific goal is to elucidate the physical mechanisms for the formation of prestellar cores out of the diffuse medium, crucial for understanding the origin of stellar masses. This research has made use of data from the Herschel Gould Belt survey (HGBS) project (http://gouldbelt-herschel.cea.fr). The HGBS is a Herschel Key Programme jointly carried out by SPIRE Specialist Astronomy Group 3 (SAG 3), scientists of several institutes in the PACS Consortium (CEA Saclay, INAF-IFSI Rome and INAF-Arcetri, KU Leuven, MPIA Heidelberg), and scientists of the Herschel Science Center (HSC). and cite the introductory paper of the Herschel Gould Belt survey by André et al. (2010, A&A, 518, L102). Di Francesco et al., in prep.